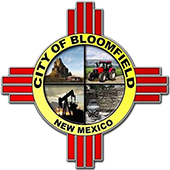 The City of Bloomfield is an Equal Opportunity Employer. In compliance with the Americans with Disabilities Act, the City will provide reasonable accommodations to qualified individuals with disabilities and encourages both prospective employees and incumbents to discuss potential accommodations with the employer. Fax application to (505) 632-6353. Resumes will not be accepted in lieu of the city application form. When required of the position, attach a copy of certification(s) or license(s). Copies of high school diploma/GED & college degree must be provided at time of interview. Pre-placement physical exams are required for some positions. Incomplete applications may delay or exclude consideration of your application. Generous paid vacation and sick leave along with 11 paid holidays. To view the most current job openings, see the Job Vacancies at the top of this page. For any questions please call (505) 632-6371 or come by the administration office at 915 N. First Street from 7:00 am – 5:30 pm, Monday through Thursday.